On Saturday 14 December 2013, Dutch national TV broadcasted a documentary about Jan Smeets, ‘Mr. Pinkpop’. He is one of the founders of the festival. Jan has been organizing it since 1970. 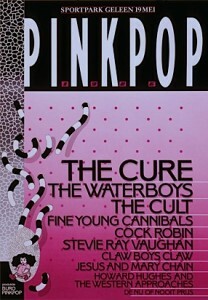 In this documentary Jan and others, including Leon Ramakers of Mojo Concerts, were being interviewed about the Pinkpop 1986 story. 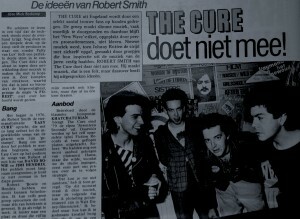 After the badly attended editions of 1984 and 1985, Jan engaged the services of Mojo Concerts, booker for The Cure in the Netherlands. It was Mojo who came up with the ideas for a later curfew, a bigger stage and The Cure to headline the festival. So it seems the credits for the successful 1986 edition have to go to them as well. The documentary (YouTube link) shows the original footage of the opening song Shake Dog Shake (at approximately 52 minutes), which has not been broadcasted since 1986. As they use exactly the same imagery as has aired back then, it seems that no other footage has been preserved. Which of course is a pity.